There's no sign of Damien Hirst in his restaurant in Ilfracombe, but even if the notorious BritArt star did turn up, would there be room for him? Early on this sunny Saturday evening, 11 The Quay is filling with hungry customers. The two dining-rooms upstairs, called Harbourside and the Atlantic Room, are fully booked. In the more casual ground-floor bar, couples with small children plus locals and assorted holidaymakers mull over a list of 20 or so tapas, ranging from a dish of hummus to a grilled mackerel with salad for £8. We're going upstairs for dinner later, but in the meantime we order two tapas from the £4 section; first, hunks of meatily packed, top-quality chorizo in red wine, winningly served with crunchy fresh fennel, then a delicious portion of herrings, richly pickled in sherry vinegar. A good start, although I promise not to make any lame jokes about pickled sheep or sharks - and not just because of the physical impossibility of mirth in a mind that's barely living. Here in Devon, the old BritArt argument that the thing is the thing is the thing applies. Tonight, the new restaurant is the thing and we have come to see what Hirst has created. 11 The Quay is situated in the centre of the town's small harbour, and was previously a tall, narrow pub called the White Hart, now demolished and rebuilt with stunning results. In fine weather, the ground floor opens on to the street and, with its white walls, sturdy tables and harbour views, it has a modern Mediterranean feel. Upstairs, the Harbourside restaurant has romantic French windows that open over window boxes stuffed with lavender, and a view of bobbing boats, while the dramatic Atlantic Room looks straight out over the sea. The latter, with its soaring ceiling and giant window flooding the space with pearlescent light, feels like the inside of a giant, ocean-going cathedral. In both rooms, there are thick Russian linen tablecloths, stunning oak floors and waiter service that may not be particularly polished but oozes with dimpled Devon charm. It is disappointing that no bravura new Hirst artworks are on show, but a waitress whispers that "something special is on the way". Until then, the bare walls must await their fate and the overall atmosphere remains cool and restrained, with only a few blue glass decanters and a fish tank enclosed in a dividing wall to distract the eye. The real star is the light dancing off the sea, and the designers have done well in maximising its shimmering potential. The same dinner menu is served Harbourside - where we now are - and in the Atlantic Room and, to be frank, it is a mess. With six choices in both the starter and main course sections, it features an outmoded, boring, international parade of restaurant food that takes scarce notice of surroundings or seasonality and was put together by someone who hasn't a clue about running a modern restaurant - or who is desperately trying to make it simple for an over-stretched kitchen. Although 11 The Quay promises seasonal, local produce, what it delivers is Asian-scented pork belly, Aberdeen Angus sirloin steak, duck leg confit pancakes with a sweet and sour sauce, butternut squash risotto, Manchego cheese and one of Hirst's own favourite dishes from The Ivy in London, frozen mixed berries with white chocolate sauce. Devon farmers and artisans, who make some of the most luscious produce in the country, have my permission to pull on their wellies and riot. There's even a dish of Gressingham duck breast with port jus, carrots Vichy and Savoy cabbage bubble and squeak, which seems to be straight out of a catering college manual. Surely if there is ever a moment for such a thing on a menu - and I have my doubts about that - then that moment is in the depths of winter. The selection here - in summer in a harbour town - is meat-led and the only main course fish dish on offer is a baked fillet of environmentally correct pollack, served on mustard mash with tomatoes. The reason pollack is not an overfished species is simple; it's horrible, with a bitter flavour and the texture of thick tapioca. Red mullet or black bream would sit much more happily on this menu, and still meet the approval of the Marine Conservation Society. Still, hats off to 11 The Quay, which has herring, mackerel, grey mullet and spider crab on its far more successful tapas menu and makes Hirst, perhaps for the first time in his life, politically and environmentally correct. Despite the disappointing dishes, the kitchen cooks everything very well. A starter of Atlantic prawns stuffed with mozzarella, rolled in Parma ham and grilled, then served with chipotte chilli sauce, is more successful than it messily sounds and while there is not much cooking in serving a boiled globe artichoke with lemon butter, it is good to see this elegant old favourite. Wrong place and wrong time for a main course of garlic-studded lamb with roast beetroot and flageolet beans, with a sauce enriched by redcurrant jus; a trick once briefly modish, now practically a museum piece. An apricot tart is good, with a nice crisp pastry base, but it's back to the drawing board with the icy berries, boys. They're meant to be frozen individually, not served like a clump of something that's just been carved out of a calf's innards. Which reminds me. Loving restaurants and loving eating in restaurants, as Hirst professes to do, is not enough of a qualification to ensure that everyone is going to love his, or go home happy. Much work needs to be done here. The beautiful building deserves it. 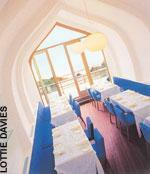 11 The Quay, Ilfracombe, Devon (01271 868090 ). Dinner for two, excluding drinks and service, £60.